Saint Lucia is one of My Vacation Lady’s favorite Caribbean Islands for honeymooners because it is so different than many of the islands. It is so much more than just a beach destination. What makes St Lucia a unique honeymoon destination? Where else would you be able to stay in a room with only 3 walls, built into the side of a mountain with views of the Pitons and, perhaps, your own private pool? 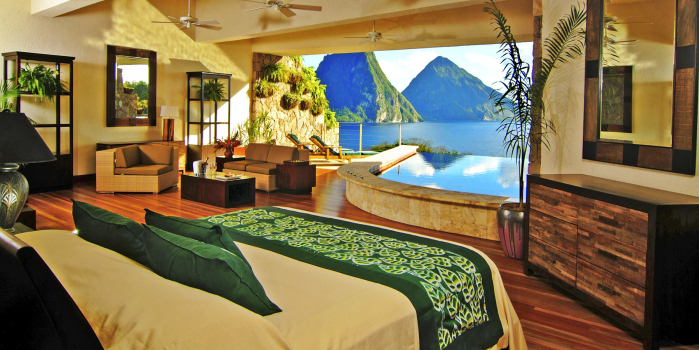 You can at resorts like Jade Mountain, Ladera and Anse Chastanet. You can enjoy your own villa or cottage with a private pool at resorts like Calabash Cove, Sandals. Ti Kaye and Cap Maison. You can stay in 2 different hotels in 2 separate parts of the island for a completely different feel. What experiences would honeymooners enjoy in St Lucia? 1. Take a sunset cruise a look out for the elusive green flash as the sun sinks into the sea. 2. Take a walk to the Diamond Falls and then take a dip in the Diamond Mineral Baths to soak any any leftover stress from the wedding planning! 3. Take a hike up the Pitons. This is a HIKE- not a moderate stroll so make sure you’re prepared with shoes other than flip flops. 4. Take a bike ride through a rainforest and end up at Errard Waterfall, where you and take a dip in the water. 5. Horseback ride in the ocean! 6. Take an ATV excursion through the hills and along the coastline. 7. Take a catamaran down the coast and walk though a chocolate plantation and make you own chocolate bar! 8. Explore the drive through volcano and take a mud bath and swim under a waterfall. 9. Take a combination of dune buggy and zip line excursion. 10. 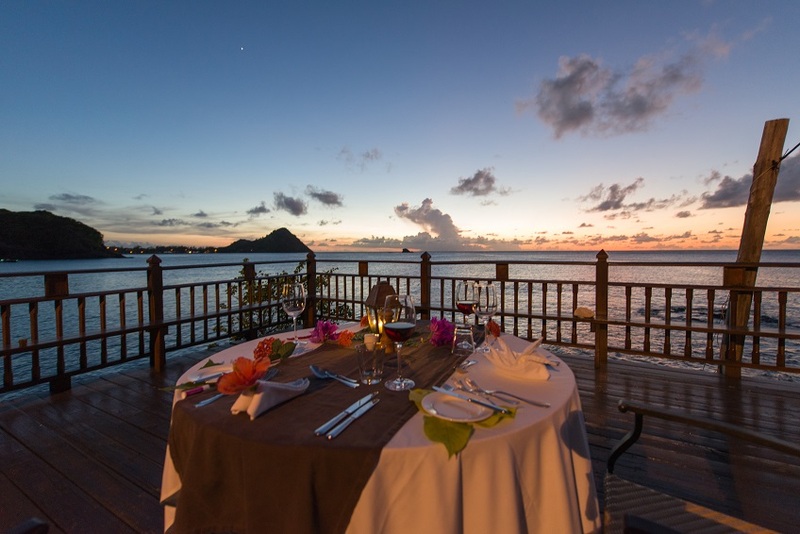 Have a romantic dinner on a private pier overlooking the sea. Whether you want pure romance or fun and activities, Saint Lucia has it all. My Vacation Lady is the top rated honeymoon specialists located in New Jersey according to the couples on Wedding Wire. When it comes to your dream honeymoon, you deserve the best and My Vacation Lady will make your honeymoon experience special. Contact us to schedule your honeymoon consultation.